On May 24, 2012, I sat down with my friend Jessica Sackett and channeled a dissertation entitled, “The Long View.” The island was cool and wet, and as we worked, a thunderstorm broke out and provided the perfect soundtrack. The Long View was apropos for the two of us; we met “coincidentally” in Columbus, Ohio during the 2008 Kuthumi Weekend with Crimson Circle. She “forgot” her checkbook in my hotel room during her private session. I noted her address—Stoughton, Wisconsin—and was triggered by the circumstance of her being from my home state. During that session, Jessica asked about her vision of opening a store/classroom where she could sell inspiring and beautiful merchandise as well as offer classes and coaching sessions. The former buyer for Nordstrom’s was also a life coach and wanted to know if she was correct in moving forward to build it. The answer was clearly, yes. As she took on the tasks to open her own store/classroom in a small town right outside Madison, she came regularly for tune-ups with the Party. Whatever they all did together worked, as she opened Hand With Seeds on December 4, 2009. From the start, she put every resource she had into making HWS a success. HWS became a central stopping point in Stoughton where beauty met transformation met community spirit. My first workshop there took place in May 2010. I booked it to coincide with my return trip from Corpus Christi, Texas where I spend the winter. In fact, we were planning regular semi-annual stops for Einstein and the Party as I was coming north in the Spring and returning in the Fall. So why we agreed upon a February 2011 date was beyond me. I think I originally booked it because I “missed cross-country skiing.” But as the time approached and I read the weather forecasts from my balmy flat in downtown CC, I found it difficult to rationalize why I was spending the money to go back into the cold. Finally, I gave in and flew north. The joke was, there wasn’t enough snow to ski anyway. But it’s always a joy to see Jessica, and Hand With Seeds had grown considerably in notoriety among the spiritually minded in the area. I had been mildly paying attention to this new governor and his budget, but not enough to know what was taking place as I landed in Milwaukee that winter. On February 14, the Teachers Aide Association of UW-Madison presented thousands of Valentine’s Day cards to Scott Walker, begging the governor not to slash education. 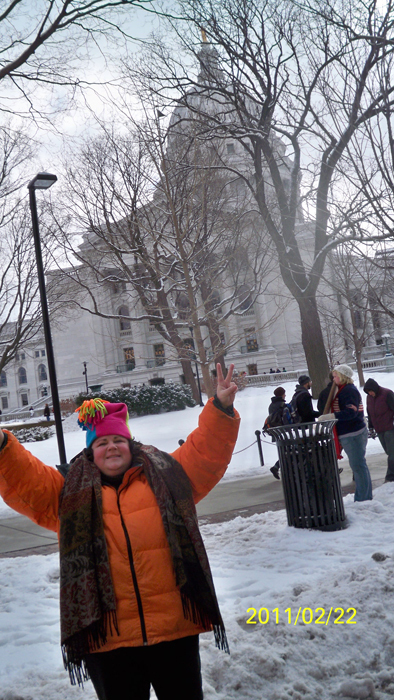 Two days later, 14 Democrats fled the state in one of the most courageous stands for democracy in State history, 100,000 citizens showed up to occupy the capitol, and my life changed on a dime. Throughout the past 18 months, I have often heard Einstein telling me that this was what all my training was for. Wisconsin’s Revolution put everything I’d learned about Conflict REVOLUTION for the past 18 years to the test. Being at Hand With Seeds in February 2011 set a path before me I had not planned on and certainly did not expect. Had I not been there during the turmoil, I would never have met so many great democracy-loving Wisconsin-ites, like the two scientists who independently testified about the truth of the sulfide in the 22-mile open-pit iron ore mine on the shores of Lake Superior. These two heroes traveled north to collect rocks from the site and have them independently analyzed. 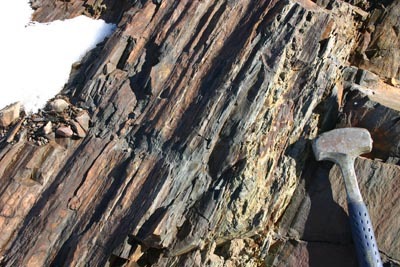 Hematite, a biologist, geochemist and geologist, along with a geologist who specializes in iron ore, chipped away at the billion-year-old rocks together one cold February afternoon in the Penokee Hills. Their expert testimony was a turning point in bringing the mining bill to a grinding halt. Not long after I decided to dedicate my energy to standing strong against the corporate takeover of my government, Hand With Seeds closed. Jessica could be proud of her vision coming into reality, and all the lives she touched in the time she was open. However, it’s understandable that she felt deep emotion around the folding of her long-time dream. When she came to visit me in May, we talked again about how everything takes place for purpose, and that her store served so many, more than she can ever see. I told her, in the long view, for me personally, being in Madison at that moment would never have happened without her and her dream. Because I was there to see first hand what was really happening, I was influenced in a way that did not communicate across state lines. This meant I was able to mindfully redirect my energy to use my voice to stop a terrible pillage of the land and water up north. Helping protect my Anishinabe neighbors from losing their wild rice to sulfide drainage was just the beginning of what we protected. 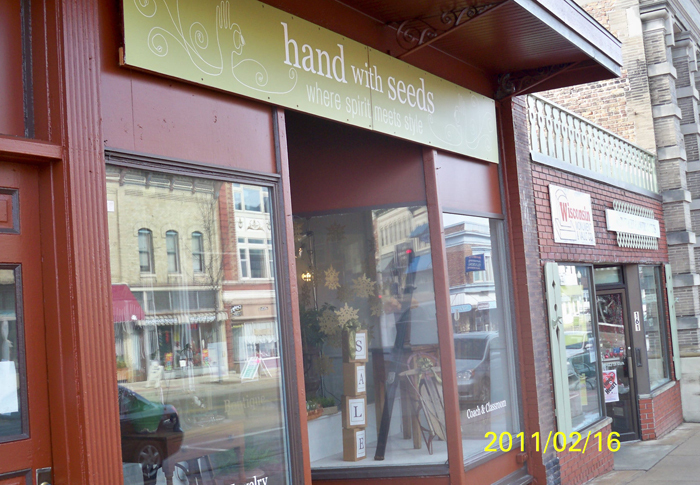 There Jessica sat on that rainy day in May, on Madeline Island and in the middle of what Hand With Seeds influenced. She could now see the real people and the magnificent water she indirectly helped to protect. Neither of us saw this coming in Columbus, Ohio in 2008. Like my visit to Stoughton that changed my life and sent me on a new direction, Jessica was sent on a new path when her store closed. I have no doubt she, too, will just do it, and relish every step of wherever she is going. When you wonder if the events of the universe are working for or against you, take the long view. While standing on the side of the road with scientists last winter, one carefully explained how each layer of rock represented 1,000,000 years of Earth history. In the end, we will end up hardly a speck of dust in a layer of the Earth. How’s that for a long view. So in the end, it’s all a mystery? The perfect reason not to sweat the small stuff, commit to the unknown, live in mindful compassion, and just do it—whatever “it” is for you. Free downloads of The Long View, as well as a bonus song, Innocent Future, are available here. Also Summer Reading Sale: $99 an hour plus MP3 recording of the session.